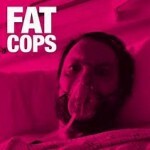 Share the post "Album review: FAT COPS – s/t"
It’s hard to work out whether this Fat Cops ensemble is a serious project, or whether a bunch of blokes with other, loftier careers have simply got together to have a bit of a blast. Maybe it’s both. Maybe it doesn’t matter. The end product is pretty good fun. Vocalist Chris Deerin is a well-known journalist and currently directs the heavyweight policy think-tank Reform Scotland. Guitarist Robert Hodgens used to be Bobby Bluebell from The Bluebells and has rubbed musical shoulders with Brian Wilson, Sinead O’Connor, Ian McCulloch and others on an eye-catching cv. Then we have Al Murray on drums. (Yes, that Al Murray). And Neil Murray on keys (No, not that Neil Murrray. This one is a doctor and happens to be the spouse of JK Rowling). However the story of the band is that it was actually put together by IT manager and part-time bassist Chris Ayre, who goes by the monicker of ‘Bass Chris’. He was bequeathed a guitar by his Auntie, a member of The Wee Bessoms (no idea…) and the band has been christened in honour of their track ‘Look At All the Fat Cops’. Lovely story. Probably true. But it matters not. Because these middle-aged chaps, who all should really know better have smashed up an enjoyably eclectic racket layered thick with influences as diverse as pop-punk, trippy dance, stoner-indie, and glam rock. ‘Hot Tub’ kicks of the party in pleasing style with an homage to the jangly instant appeal of The B-52s. ‘Drink All The Drink’ follows up with a more obvious Stone Roses stomp, matching the opener for tongue in cheek lyrics. Simple fayre, but laid down with gusto and spirit. We are then squarely in to Happy Mondays territory for the bass-groove driven ‘Hands Up! Get Down!’ Norman Blake from Teenage Fanclub contributes backing vocals on this one. And if you thought you were getting the hang of the collection, the 60’s pop organ of ‘I Love Girls (He Loves Girls)’ over some camp ‘ooh-la-la-las’ will provide a further diversion. Al Murray, a drummer since childhood apparently, has a proper cut at this. The bass rumble of ‘Good Looking’ is a cover of Bass Chris’s Aunties’s band and he does fair justice to her vintage black Rickenbacker. Deerin’s vocals often have a twang of a Divine Comedy spoof throughout the album and that’s a hard feeling to shake. But on this track he is much more compelling. If the journalism runs into the sand, his Scott Walker baritone pipes might provide a second career. The journey continues with ‘Saving Grace’, possibly the best track here, featuring some dishy pysechedelic guitar to finish up the track, followed up by the full production number ‘Fat City’, all shimmering guitar, earnest vocals and lush strings. Before I get too carried away, I need to remind myself that ‘Shouldn’t Really’, a dirge-like offering, and the messy, faux-psyche ‘Voodoo Nightstick’ are both terrible. But neither of them last very long. This entry was posted in ALBUM REVIEWS, ALBUM REVIEWS (Mobile), All Posts and tagged Al Murray, album review, Chris Deerin, Fat Cops, indie, pop, psychedelic, review, rock, The Wee Besoms. Bookmark the permalink.